I once read on a holistic beauty blog that you could use turmeric as a face mask for beautifying results. From previous posts, you may have deduced that I love a good DIY home spa treatment. So, I mixed up the mask, heavy on the turmeric, and trustingly applied it to my fair skin. I turned out looking like one tall blue beehive short of Marge Simpson. Which, in hindsight, seems pretty obvious given that turmeric is still used in some cultures to dye cloth. I spent the rest of that night washing my face, trying to go from dandelion yellow to just slightly jaundiced. After that experience I vowed to keep my turmeric experiments to edibles. And there are plenty of reasons to keep experimenting with turmeric in your diet. One of the most well-researched herbal remedies in the world, turmeric has been used to treat a vast variety of health concerns. While turmeric (often isolated to one of its main bioactive constituents, curcumin), has only recently enjoyed fame in North America, it has been revered as a panacea in India for centuries. Specifically, curcumin has been shown to turn off NF-kB, a molecule that turns on genes related to inflammation . This may explain turmeric’s action on many of the disorders listed below. Inflammation underlies many diseases such as heart disease, diabetes, metabolic disorder, inflammatory bowel diseases, cancer, and many others. Turmeric can help reduce the severity and overall risk of these disease processes . Antioxidants are what neutralize free radicals, which are a major cause of tissue damage and aging in the body. Turmeric not only is an antioxidant itself, but it also stimulates the body’s own production of antioxidants [3, 4]. Likely because of its anti-inflammatory effects, turmeric is helpful in reducing pain and slowing degenerative processes like rheumatoid and osteoarthritis [5, 6]. Many studies link the consumption of turmeric to liver damage prevention and recovery . Curcumin boosts Brain-Derived Neurotrophic Factor (BDNF), which is a brain hormone that stimulates nerve growth. Brain disorders such as Alzheimer’s and depression have been linked to low levels of BDNF. By stimulating new nerve cells to grow, brain functioning may improve and degeneration may even reverse [8, 9]. Turmeric can help to mitigate the uncontrolled rate of cell growth that is the hallmark of tumour growth and metastasis . I’m sure you are now antsy to begin incorporating this sunny yellow spice into your diet. Of course, it is probably best known for its use in Indian-style curries, but it can also be mixed into chai tea. 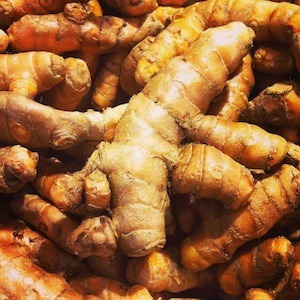 Turmeric’s pungent, astringent, and slightly bitter flavour mixes well with spicy, fragrant Eastern spices like cumin, cardamom, ginger, and cinnamon, as well as bolder Caribbean flavours like black pepper, allspice, chili, and oregano. A delicate touch of turmeric adds interest and colour to even sweet dishes with strong presences of coconut and lime. Here are a few creative recipes to get you started. Should I emphasize that you really have to try the turmeric ice cream? Trust me!